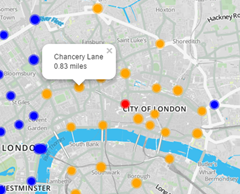 The London Underground – Can I walk it? To use it start by selecting the station you want to walk from, either by using the “Where am I?” dropdown or by clicking one of the coloured station symbols (or close to it). The map will then refresh, the station you selected is marked by a red disk, the stations within 1.5 miles of the starting station are marked by an orange disk and those more than 1.5 miles away are marked by a blue disk. 1.5 miles is my “walkable” threshold, it takes me about 25 minutes to walk that far. You can enter your own “walkable” threshold in the “I will walk” box and press refresh or select a new starting station to refresh the map. The station markers will show the station names on mouseover, and the distances to the starting station once it has been selected. This tool comes with no guarantees, the walking distances are estimated and these estimates may be faulty, particularly for river crossings. Weather conditions may make walking an unpleasant or unwise decision. The tool relies on the user to supply their own reasonable walking threshold. Your mileage may vary. To give a little background to this project: I originally made this tool using Tableau. It was OK but tied to the Tableau Public platform. I felt it was a little slow and unresponsive. It followed some work I’d done visualising data relating to the London Underground which you can read about here. 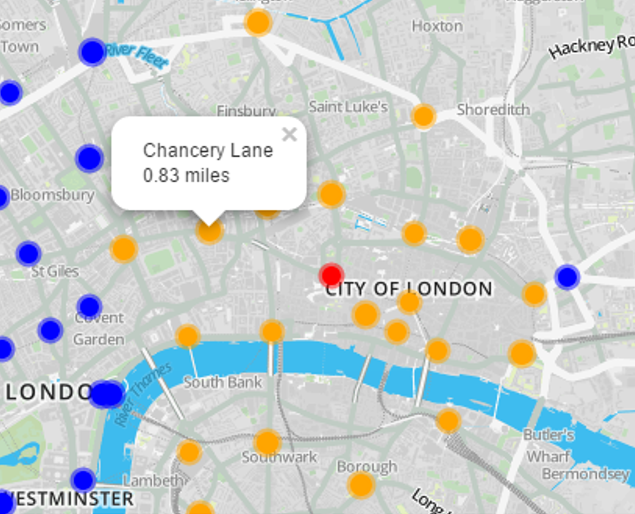 The underlying data for this tool comes from Open Street Map, where the locations of all the London Underground stations are encoded as latitude and longitude. With this information in hand it is possible to calculate the distances between stations. Really I want the “walking distance” between stations rather than the crow flies distance which is what this data gives me. Ideally to get the walking distance I’d use Google Directions API but unfortunately this has a rate limit of 2500 calls per day and I need to make about 36000 calls to get all the data I need! To me the London underground is an almost magically teleportation system which brings order to the chaos of London. This is because I rarely visit London and know it only via Harry Beck’s circuit diagram map of the underground. 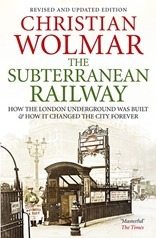 To find out more about the teleporter, I have read The Subterranean Railway by Christian Wolmar. London’s underground system was the first in the world, it predated any others by nearly 40 years. This had some drawbacks, for the first 30 years of its existence it ran exclusively using steam engines which are not good in an enclosed, underground environment. In fact travel in the early years of the Underground sounds really rather grim, despite its success. The context for the foundation of the Underground was the burgeoning British rail network, it had started with one line between Manchester and Liverpool in 1830 by 1850 the country had a system spanning the country. The network did not penetrate to the heart of London, it had been stopped by a combination of landowner interests and expense. This exclusion was enshrined in the report of the 1846 Royal Commission on Metropolis Railway Termini. This left London with an ever-growing transport problem, now increased by the railway’s ability to get people to the perimeter of the city but no further. The railways were the largest human endeavours since Roman times, as well as the engineering challenges there were significant financial challenges in raising capital and political challenges in getting approval. This despite the fact the the railway projectors were exempted from the restrictions on raising capital from groups of more than five people introduced after the South Seas Bubble. The first underground line, the Metropolitan, opened in 1863 it ran from Paddington to Farringdon – it had been 20 years in the making, although construction only took 3 years. The tunnels were made by the cut-and-cover method, which works as described – a large trench is dug, the railway built in the bottom and then covered over. This meant the tunnels were relatively shallow, mainly followed the line of existing roads and involved immense disruption on the surface. In 1868 the first section of the District line opened, this was always to be the Metropolitan’s poorer relative but would form part of the Circle line, finally completed in 1884 despite the animosity between James Staats Forbes and Edward Watkin – the heads of the respective companies at the time. It’s worth noting that it wasn’t until 1908 that the first London Underground maps were published; in its early days the underground “system” was the work of disparate private companies who were frequently at loggerheads and certainly not focussed on cooperating to the benefit of their passengers. The underground railways rarely provided the returns their investors were looking for but they had an enormous social impact, for the first time poorer workers in the city could live out of town in relatively cheap areas and commute in, the railway companies positively encouraged this. The Metropolitan also invested in property in what are now the suburbs of London, areas such as Golders Green were open fields before the underground came. This also reflects the expansion of the underground into the surrounding country. The first deep line, the City and South London was opened in 1890, it was also the first electric underground line. The deep lines were tunnelled beneath the city using the tunnelling shield developed by Marc Brunel, earlier in the 19th century. Following the first electrification the District and Metropolitan lines eventually electrified their lines, although it took some time (and a lot of money). The finance for the District line came via the American Charles Tyson Yerkes, who would generously be described as a colourful character, engaging in financial engineering which we likely imagine is a recent invention. Following the First World War the underground was tending towards a private monopoly, government was looking to invest to make work and ultimately the underground was nationalised, at arms length, to form London Transport in 1933, led by the same men (Lord Ashfield and Frank Pick) who had run the private monopoly. The London underground reached its zenith in the years leading up to the Second World War, gaining its identity (roundel, font and iconic map) and forming a coherent, widespread network. After the war it was starved of funds, declining – overtaken by the private car. Further lines were added such as the Victoria and Jubilee lines but activity was much reduced from the early years. More recently it has seen something of a revival with the ill-fated Public-Private Partnership running into the ground, but not before huge amounts of money had been spent, substantially on improvements. As I write, the tunnelling machines are building Crossrail. I felt the book could have done with a construction timeline, something like this on wikipedia (link), early on there seems to be a barrage of new line openings, sometimes not in strictly chronological order and to someone like me, unfamiliar with London it is all a bit puzzling. Despite this The Subterranean Railway is an enjoyable read.